The caption on the original read 'Coloured lithograph showing part of the London & Birmingham Railway, with the city of Birmingham visible in the background' whilst the title indicated that the view was "near Saltley". Despite the railway in view not being the Midland Railway's Birmingham to Derby line (it was another 17 years before it was built) it does provide a view of the topography of the area that is very different to the one seen in later photographs. The scale of railway building and the size of the engineering feats can only be marvelled at when one considers they were built with little more than a pick and shovel. 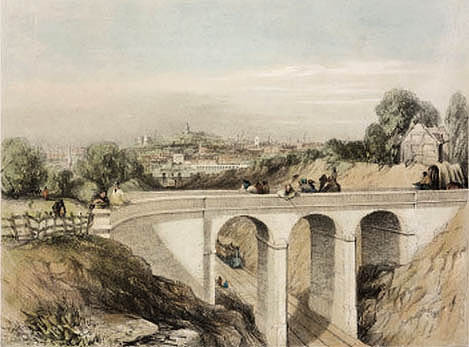 John Fancote writes, 'The bridge shown in the lithograph is Bridge No 370 on the Rugby to Birmingham Line at 110 miles 1236 yards and it appears that Bridge Road and Pretoria Road meet on the bridge'.